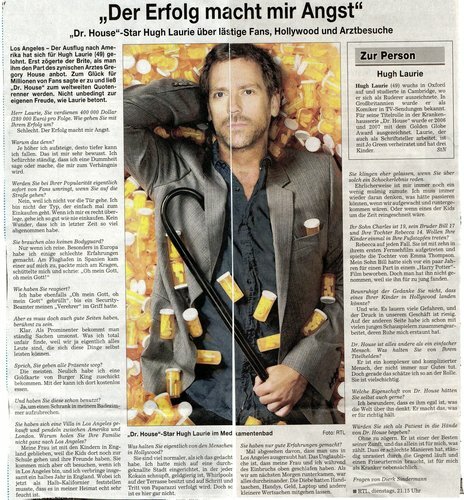 Interview with Hugh Laurie (German) (Translation is below). Interview with Hugh Laurie in our newspaper ("Stuttgarter Nachrichten) of Saturday 20th September 2008, where he talks about being famous, annoying mashabiki (the really crazy ones), Hollywood and so on.. HD Wallpaper and background images in the House, M.D. club tagged: house md house article. This House, M.D. photo contains anime, comic kitabu, manga, cartoon, and mkono. There might also be gazeti, karatasi, magazine, tabloid, rag, jarida, tabloidi, and limemalizwa. I translated the article...but there might be some mistakes in it. Dr. House star Hugh Laurie about annoying fans, Hollywood and visits to the doctors. Introduction: Los Angeles - Excursion to Los Angeles did really pay off for Hugh Laurie. At first the Briton was hesitating when he was offered to play the part of the cynical physician Gregory House. Fortunately for many fans he approved and turned „House“ into a Tv show with huge ratings worldwide. Not exactly to the joy of Hugh Laurie, as he emphasizes. Interviewer: Mr. Laurie, You earn 400.000 $ (280.000 €) per episode. How are you dealing with your success? Hugh Laurie: Bad. The success scares me. HL: The higher I rise the farther I can fall. I'm very aware of that. I'm always afraid that I say or do something stupid, which will become my doom. I: Are you actually sorrounded by fans as soon as you leave your house? HL: No, because I don't leave the house. I'm not the type who just goes shopping. When I come to consider it I go shopping pretty much never. No surprise I lost so much weight of late. I: So you don't need a bodyguard? I: How did you react? I: But there have to be also positives aspects of being famous. HL: Sure. As celebrity you always get things for free. Which I consider as completely unfair, because actually all of us are people who can afford these things. I: Thus, you give your presents away? HL: Most of them. Lately Burger King send me a gold card. With that card I can eat for free. I: And did you already use it? HL: Yes...to prize a bathroom cupboard open. I: You bought a villa in Los Angeles and you are plying between America and London. Why don't you send for your family to Los Angeles? HL:My wife remained in England with the children because the kids still go to school there and have their friends. But they visit me often when I stay in Los Angeles and I spend half a year in England in total. Whereas I have to notice now as half- Californian that it is very humid in my homeland. I: What do you think of the people in Hollywood? HL: They are a lot more normal than I thought. I prepared myself for a crazed city, in which everyone takes cocaine, is money-mad, has hot tubs on the terrace and is followed by paparazzi wherever he goes. But it's nothing like that. I: You just had positive experiences? HL: Well, apart from that that we were robbed in Los Angeles. The unbelievable is that me and my wife were sleeping upstairs while we were robbed. When we went downstairs the next morning everything was in a mess. The thiefs had stolen handbags, cell phones, money, laptop and other little valuables. I: You sound rather calm when you're talking about such a shocking event. HL: To be honest I still feel a little queasy. I think about it again and again andf aboot what could have happened if we had woke up and went downstairs. Or if one of the kids would have entered the house at that time. I: Your son Charles is 19, his brother Bill 17 and your daughter Rebecca is 14. Does anyone of them want to follow in the footsteps of you? HL: Rebecca definitely. She had her first role with 10 and played the daughter of Emma Thompson. My son Bill applied for a part in Harry Potter a few years ago. But they didn't choose him because they thought he was to young. I: Isn't that fazing for you that one of your children could end up in Hollywood? HL: And how! Danger is everywhere and the pressure in our business is huge. On the other hand I've already worked together with many young actors whose calmness was astonishing for me. I: Dr. House is everything but an unsophisticated person. What do you think of your eponymous hero? HL: He is a complex and difficul person, who doesn't good all the time. But that's exactly what I like about my role. It's complex. I: Which feature of House would you like to have yourself? [b]HL: I admire that he doesn't care about what the world thinks of him. He does what he considers as right. I:Would you let Dr. House treat you as his patient? HL: Without hesitation. He is one of the best of his kind and that's already enough for me. That he has bad manners, is constantly unshaved and needs an appointment with the hairdresser is negligible for me as patient. Hugh Laurie (49) grew up in Oxford and studied in Cambridge, where he distinguish himself as oarsman.In Great Briton he got famous as comedian in TV shows. For his starring role in „House MD“ he recieved the Golden Globe in 2006 and 2007. Laurie, who also works as author, is married to Jo Green and has three children.